review – Page 3 – James Proclaims! Hannibal Lecter is arguably one of the most iconic screen characters of all time. There have been multiple incarnations of Thomas Harris’ man-eating serial killer over the years, both in movies and through a more recent TV series. The most notorious portrayal is without doubt that of Anthony Hopkins, and of his three outings, the definitive performance is his work in 1991’s The Silence of the Lambs. Which is fortunate for me, as that remains the only Hannibal Lecter film I’ve ever seen. This is in part due to a general indifference I have towards the genre. I don’t mind a good psychological thriller, but given a choice of watching that or a lower quality action flick starring Dwayne ‘The Rock’ Johnson, well, sometimes you just need to switch your brain off. But a good film is a good film and there’s no denying that The Silence of the Lambs is a very good film. It’s possibly an additional reason that I’ve never really bothered to watch another Hannibal Lecter outing – the 1991 movie is so astoundingly excellent that even if all the other incarnations are good, they still can’t possibly live up to the standards set by Jonathan Demme’s directorial masterpiece. Winning multiple Academy awards, including Best Picture, Best Director, alongside an Oscar apiece for leading actors Hopkins and the equally brilliant Jodie Foster, The Silence of the Lambs absolutely transcends any notion of genre and instead is the kind of movie for which there are insufficient superlatives to describe it’s virtuosity. 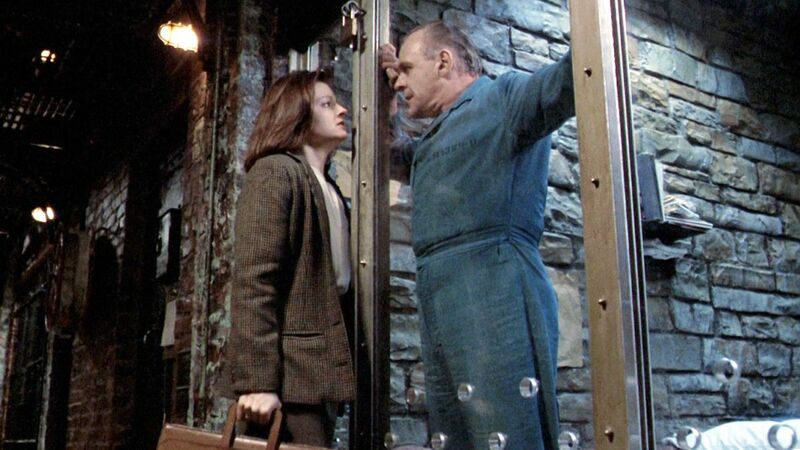 Hopkins rightly picked up the plaudits for his chilling portrayal as Lecter, but it’s actually Foster who does most of the heavy lifting and her performance as Clarice Starling is really what holds the movie together – she doesn’t get to have as much fun as Hopkins does, but it’s hard to imagine how the movie could work with anyone else in the lead role. I first watched The Silence of the Lambs shortly after its release, some time in the early nineties. I was probably a bit too young to appreciate all of its merits at the time, though there was more than enough gore to keep the attention of a prepubescent teenager. On re-watching it in recent weeks though, it still seems to be more than a cut above Hollywood’s usual offerings. Given the darkness of the subject matter, and the occasionally visceral nature of some of the scenes, it doesn’t make for easy viewing and won’t be everyone’s cup of tea, but it has more than stood the test of time. It’s abundantly clear why there will almost certainly be many more incarnations of everyone’s favourite cannibal for years to come, though it remains improbable that any will ever quite match this cinematic tour de force. 1984’s Romancing The Stone is perhaps as rare an entity as the eponymous gemstone around which much of the movie is centred. Very much a film of its time in some respects (soundtrack being the most obvious), it’s timeless in others, combining a classic adventure story with many of the elements that form the basis of a good rom-com. The action is non-stop, there are some pretty cool stunts on display and a genuine sense of jeopardy throughout. At the same time it manages to be genuinely funny – a young Danny Devito probably deserves the most plaudits for the comedy within the film but there are plenty of laugh-out-loud moments when he is nowhere to be seen. The romance too, is definitely a central theme – protagonist and romance novelist Jane Wilder (Kathleen Turner) seems to find herself living out the plot of one of her own novels, as she forms an unlikely relationship with the seemingly unscrupulous but dashing Jack Colton (Michael Douglas). One of Robert Zemeckis’ earliest directorial outings, Romancing The Stone was a fair indication of the success he would go on to have, indeed his next project was a little known movie called Back to The Future. Unfortunately Zemeckis did not direct the sequel, and The Jewel Of the Nile (which admittedly is still a movie I’m reasonably fond of) was nowhere near as good and effectively killed what could have been a promising franchise. Turner, Douglas and DeVito all do what they do very well in Romancing The Stone, and to be fair, none of them can be blamed for the inferior sequel. But it’s a shame that the follow-up couldn’t live up to the original, because there really isn’t much out there that compares to it – a movie which attempts to combine a range of apparently conflicting genres and actually has the audacity to succeed. A rare thing indeed.